We have often seen deer in the woods behind our house. When I came home from lunch one of them was right by our fence. He stood there while I went outside and took his picture. 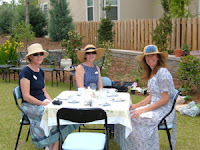 I joined the Augusta Area Newcomers Club in March, and in April I was organizing the English Garden Tea and Plant Swap, an annual event hosted by the AANC Garden Group. It was a very refined affair. Since I am also now the Webmaster for AANC, you can see more pictures of the event at the AANC website. We enjoyed our first Masters Week, although we did not get tickets. Steve was glued to the TV for the final rounds. We also had our first human visitors, our neighbours from North Carolina, Eric and Carol, and their Jack Russell terrier, Sparky. Of course Sparky was our very first visitor when he came to stay for Thanksgiving last year.